As is typical for many independent minded dentist types, I completely ignored his advice and decided to try my hand at making custom pens. It has become a wonderful hobby for me and I love the opportunity to clear my mind as I work on beautiful woods, acrylics, and even Corian (yes the same material they use to make kitchen counters). Working with these materials has taught me a few things about using tools on a rapidly rotating object (which ironically is exactly opposite of what we do in dentistry). 1) The tool must be very sharp in order to be effective. 2) A clean tool is a more efficient tool. 3) Too much heat can ruin the object. 4) Proper protection is essential. 5) Sometimes, it costs less to pay more for something. 6) If you don’t know where you’re going, you’re liable to end up somewhere else! Dull cutting instruments are a significant problem in any occupation that uses cutting. Whether working on a tooth or creating a work of art, tools are much more effective when sharp. Studies have shown conclusively that cutting a tooth with a dull bur can cause an increase in the temperature of the pulp. This can lead to pulpitis and even pulpal necrosis. The carbide steel available today is a different quality compared to many years ago. It dulls and tarnishes very quickly and when that happens, the cutting edge becomes blunt and the rake angle changes. This means you are no longer cutting tooth structure, you are pulverizing it. When a diamond bur becomes clogged or worn, the increased friction means you can literally burn the surface that you are cutting on. And when using a dull bur, you must use even more pressure to cut. The combination of a dull bur with increased pressure will assuredly lead to a spike in temperature. We are kidding ourselves if we believe that burs are truly sterile when run through an ultrasonic cleaner and then off to a sterilizer. Aside from the time consuming task of picking out burs from the drain of an ultrasonic cleaner, re-using burs after cutting away infected tooth structure is like going in for an endoscoptic procedure at a clinic that does not use proper sterilization. Do you really want to roll the dice with your health or your patients health just to potentially save a few pennies? Why wait for something unfortunate to happen when you can look your patients in the eyes and assure them that there is no chance of cross contamination in your office. Opening a new bur each time will ensure that there is no cross contamination issue in your office and can give you peace of mind. Be kind to the pulp. Avoid the increase in temperature that comes form using dull cutting tools. We wear glasses, gloves, and a mask while operating in order to protect ourselves from a variety of potential pitfalls. We also have an obligation to protect our patients and ensure that they are not inoculated with harmful bacteria simply because we did not consider the consequences of re-using burs. Protect your patients as if they were your own family members. 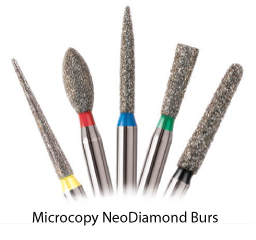 The issues mentioned can easily be prevented by using a new bur each and every time you work on a patient. When I was younger, my father would often tell me that quality was the cheapest option. If you do something right the first time, it will save a lot of time and money in remakes and discomfort. Considering the cost of a final impression using VPS material is about $30.00 each time, the expense of a new bur is insignificant. And, the benefit in time savings and reduction in trauma to our patients is more than enough to justify switching to single-use burs immediately if you are not already doing so. Make a plan to implement this concept into your practice and see what a difference using a fresh diamond can make on each and every procedure. Avoid the collateral damage that occurs from being careless. Decide today to commit to patient health and more efficient dentistry. You will not regret the decision once you realize how much less frustrating cutting tooth can be with a fresh bur. In closing you will find that single-use diamonds are not only more cost effective, they are more efficient at cutting and will save your patients precious pulp. And to answer the question that might be tugging at the back of your mind; yes I still have all my fingers in their original dimensions.